1969, Oct. 12  Dartmouth College, originally founded to educate American Indians, changes from the Indians to Big Green. 1970, April 17  University of Oklahoma drops Little Red mascot. 1971  Marquette University (WI) abolishes Willie Wampum mascot. 1971  Mankato State College (Minn) drops Indian caricature mascot. 1972, March 2  Stanford University changes from Indians to Cardinal and drops Prince Lightfoot mascot. 1972  Dickinson State University (ND) changes from Savages to Blue Hawks. 1973 -- Eastern Washington University changes from Savages to the Eagles. 1978  Syracuse University (NY) drops Saltine Warrior mascot. 1980  Southern Oregon State University drops Red Raiders motif. 1987-88  St. Johns University (NY) drops caricature logo and mascot. 1988  Siena College (NY) changes from Indians to Saints. 1988  Saint Marys College (Minn) changes from Red Men to Cardinals. 1989  Montclair State College (NJ) drops nickname and mascot. 1989, Oct. 13  Bradley University (IL) drops mascot and replaces Indian caricature logo. 1991, Feb.  Eastern Michigan University changes from Hurons to Eagles on recommendation of a state civil rights commission. 1992  Naperville Central High School (IL) drops nickname Redskins. 1992 -- Simpson College (IA) changes from Redmen to Storm. 1993  Arkansas State University drops Runnin Joe mascot. 1993 - Arvada High School (CO) changes from Redskins to Reds. 1993, April 9  University of Wisconsin passes a resolution refusing to play non-conference games against teams with Indian nicknames. 1993, Nov. 2  Bradley University (IL) adopts Bobcats mascot and drops all Indian references in its logo, but keeps nickname Braves. 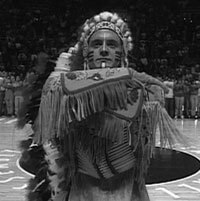 1994, April  University of Iowa bans the University of Illinois mascot, Chief Illiniwek and announces it wont schedule games with teams with Indian mascots. 1994, May 3  Marquette University (WI) changes from Warriors to Golden Eagles. 1994, June 6  St. Johns University (NY) changes from Redmen to Red Storm. 1994, Dec. 8  University of Southern Colorado drops Indian mascot after 57 years. 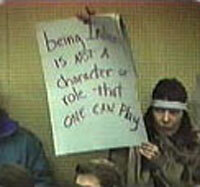 1996, March 31  Newton High School (Conn) announces they will drop their Indian mascot. 1996, July 3  University of Tennessee-Chattanooga drops mascot, Chief Moccanooga. 1996, Sept. 26  Miami of Ohio University votes 7-1 to drop nickname Redskins after being used for 68 years. 1997 -- Marist High School (IL) changed from Redskins to Redhawks. 1998, March 20  Yakima Valley Community College (WA) drops Indian nickname. 1998, April 7  Federal judge in Los Angeles upholds district policy banning Indian mascots at all of its schools. 1999. March 5  Indiana University of Pennsylvania announces it will retain nickname Indians, but change mascot to a black bear. 1999, March 5  Erwin High School, Asheville, NC discontinues calling girls teams Squaws, but retains Warriors nickname. 1999  Since 1991, 25 Wisconsin schools have eliminated Indian mascots or nicknames; 43 remain. 1999, June  Seattle University (WA) changes from Chieftains to Redhawks and drops its Indian head logo. 2000, Sept. 22  Scarborough (Maine) High School drops nickname Redskins. 2000, Oct. 17  Niles West High School (IL) drops nickname Indians. 2001, May 10  Southwestern College (CA) changes mascot from Apache to Jaguar. 2001. May 21  Woonsocket High School (SD) votes to drop Redmen nickname and mascot by 3-2 board vote. 2001. May 25 - San Diego State University (CA) drops Montey Montezuma mascot. 2001. May 27  Parsippany High School (NJ) changes from Redskins to Redhawks. 2001, June 10  Saranac Lake High School (NY) changes from Redskins to Red Storm by 6-1 school board vote. 2001, June 13  Canastota High School (NY) drops Indian mascot by 6-0 board vote. 2001, June 20  Ball-Chatham school board (IL) votes 5-2 to get rid of Indian mascots and nicknames in district schools. Chatham Glenwood High School changes to Titans from Redskins, and Glenwood Junior High no longer Braves. 2001, July 11 --West Seattle High School (WA) drops nickname Indians. 2001, July 19  Georgetown High School (SC) drops Waccamaw Warriors symbol. 2001, July 25  Maryland State School Board passes resolution opposing Indian mascots by 10-2 vote. 2001, August  Bloomington High School (IL) drops Red Raiders nickname. 2001, August 15  Colgate University drops word Red from Red Raiders nickname. 2001, August 29 -- Montgomery School Board (Maryland), largest school system in the state, bans Indian mascots, logos, and nicknames by 7-1 vote. Included is Poolesville High School, which was the Indians. Montgomery Village Middle School had voluntarily stopped using the nickname Warriors. 2002, Feb. 25  Milford High School (MI) drops Redskins. 2004, July 6  Ottawa Hills High School (MI) drops Indian mascot. 2004, July 12  Rice Memorial High School (VT) retires Little Indian mascot. 2004, Nov. 8  Southeast Missouri State changes from Indians to Redhawks. 2005, Sept. 23  Old Town High School (Maine) drops Indian nickname. 2005, Oct. 10  Carthage College changes from Redmen to Red Men. NCAA removes them from list. 2005, Oct. 10  Midwestern State University drops Indians. NCAA removes them from list. 2006, Jan. 8  West Georgia University changes from Braves to Wolves. 2006, Jan. 20  Southeastern Oklahoma State University changes from Savages to Savage Storm. 2006, Jan. 26  Chowan College (NC) drops Braves nickname and mascot. 2006. Jan. 30  Muscatine Community College (Iowa) drops Indians nickname and mascot. 2006, March 23  Kelseyville High School (CA) drops Indians nickname, and Mountain Vista Middle School (CA) drops Braves nickname. 2006, April 8  University of Louisiana-Monroe changes from Indians to Warhawks after being one of 18 schools on the NCAA list. References to the campus as the Reservation also stopped. 2006, Oct. 10  College of William and Mary (VA) announces it will remove two feathers from its logo to comply with NCAA rule. 2006, Oct. 20  Tomah (WI) School Board drops Indian mascot and logo by 4-1 board vote. 2006, Nov. 12  Newberry College (SC) drops Indian nickname. NCAA removes them from banned list. 2006, Dec. 14  Ypsilanti High School (MI) drops nickname Braves on a 4-3 board vote. 2007, Jan. 19  Salesian High School (CA) changes from Chieftains to Pride. 2007, Feb. 17 -- the University of Illinois Board of Trustees announces it will remove Chief Illiniwek from performing at athletic events after Feb. 21, 2007. 2007, March 13 -- the University of Illinois Board of Trustees passes a resolution officially eliminating Chief Illiniwek, discontinuing the use of its Chief head logo, regalia, and the names "Chief Illiniwek" and "Chief." It passes by a 9-1 vote.